March 25, 2018 – Bishop Nestor of Korsun, administrator of the Korsun diocese, celebrated the Grand Consecration of a new parish Church of the Nativity of the Most Holy Mother of God in Torrevieja, Alicante Province, Spain. During the consecration, the relics of the Holy Unmercenaries Cosmas and Damian were placed at the holy altar. After a procession with the cross, Bishop Nestor, after anointing the holy relics with myrrh, placed them together with the consecration deed into a reliquary and seal it with reliquary wax. This placement of a part of holy relics at the basis of the altar means that the Universal Church in the period of persecution was established on the bones of martyrs. In the newly consecrated church, the archpastor celebrated the Divine Liturgy. He was assisted by Archpriest Yaroslav Dybach, rector of the Parish of St. George in Valencia, Archpriest Sergiy Prosandeyed, Hiero-schema-monk Nicholas (Serbian Church), Deacon Roman Onika, and other guests of the parish in holy orders. There were some 400 worshipers including parishioners, pilgrims and guests of the community from various parishes in Spain. After the liturgy, Bishop Nestor delivered an archpastoral homily, congratulated the community with the opening of a new church and presented laudatory diplomas to churchwardens and parishioners who proved to be the most active participants in the purchasing and adorning of the new church building. The building to be later arranged according to the canons of the interior decoration of the Orthodox church, was bought in autumn 2017. At the same time, the community bought an adjacent plot of land next to the picturesque Park of Europe 400 meters from the Mediterranean coastline. 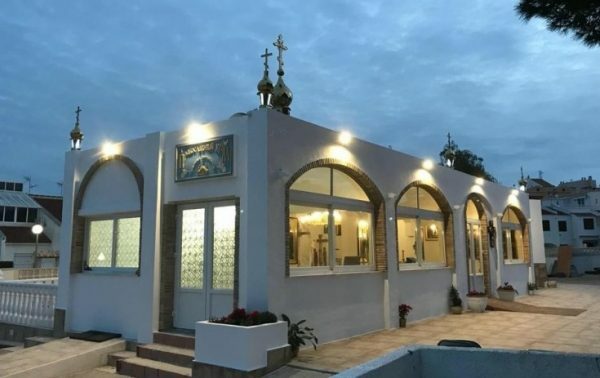 According to a report from the diocese of Korsun, the purchase of a new church facility became possible thanks to the active actions of the clergy and parishioners who managed in a short time to raise the sum necessary to continue financing the project.